The room has windows running almost the full length of the front of the room. Secondly the client required that the room be acoustically isolated from the rest of the house. Prior to any interior construction black out blinds ensured that no light entered the room from the windows. All common walls were then covered in Wavebar noise barrier material, 100kg Sound Stop entry doors were installed, and all gyprock is double sheeted with sound-check gyprock. The overall result is a room with more than acceptable noise isolation from the rest of the house. The screen dimensions, speaker placement and seating were designed based on THX recommendations. 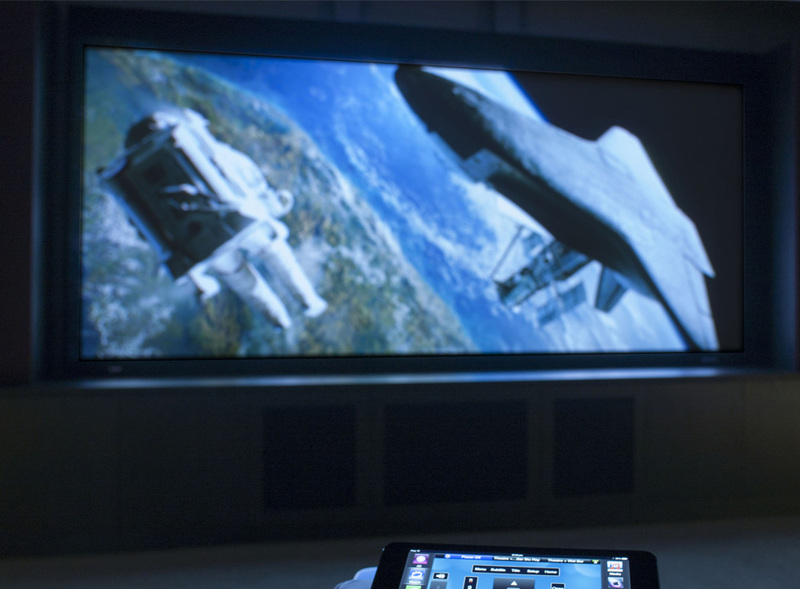 The image was provided by a Sony 4K projector fitted with a Schneider anamorphic lens. Multiple Marantz amplifiers drives eleven B&W flush mounted speakers and four Sunfire subwoofers. Control for the system is provided by Savant (which is also used to control the rest of the house). On completion the client’s exact words were “I had goose bumps within seconds of playing a scene from a film”. The theatre was awarded the CEDIA ‘Best Home Theatre $75,000 to $150,000’ award in 2014. Stewart screens is the product of choice for the state-of-the-art Dolby Theatre in Hollywood, the home of the Oscars. They are also the product of choice for us when designing high-end theatres. The quality of the screen utilised in any good cinema should never be underestimated, and, depending on the system design, it is not unusual for us to recommend a screen which will cost more than the projector itself. In this installation we utilised a 146” micro-perforated masking screen. There are two advantages to this screen. Firstly it is acoustically transparent, i.e. you can mount the speakers behind the screen making the speaker placement much more discrete, and more importantly ensuring that the positioning of the action and sound coincide. Secondly the electronic masking converts the screen to the ratio of image being projected (16:9 or 2.35:1 for example). 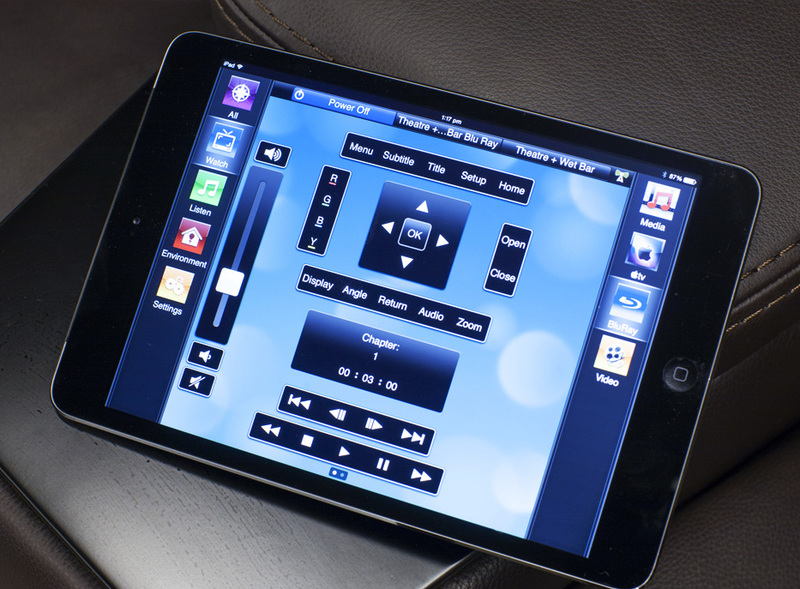 Control of the room is managed by iPad with Savant control systems installed. We included some clever features such as “Anamorphic” button in the control interface that raises the screen masking and slides the lens into place and adjusts the vertical stretch accordingly – essential for different format viewing – just like it happens at the cinema. Friendly features to improve usability are also important, which lead to the programming of a ‘Movie Start’ button which dims lights, close windows and blinds. ‘Popcorn break’ button which pauses movie as step lights ramp up to provide a path to the bar and a ‘Movie finish’ which turns on the house lights and open blinds. 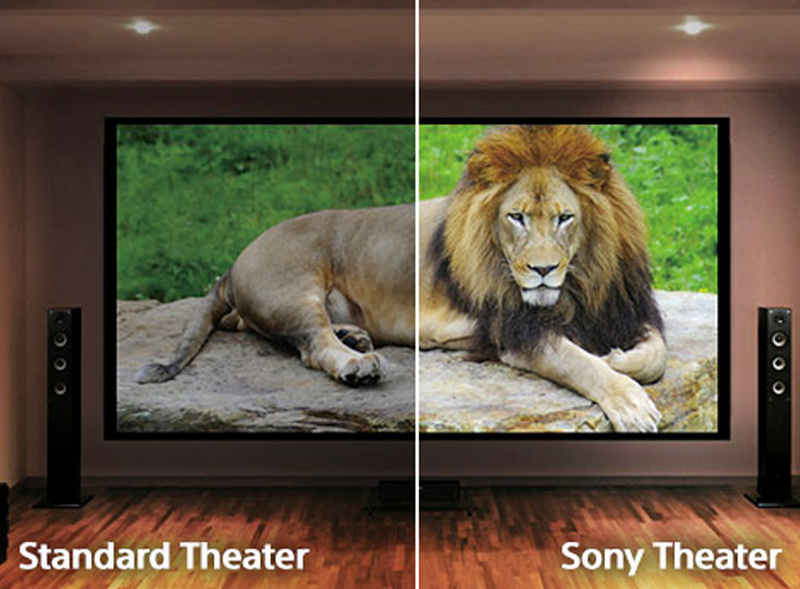 Sony is one of a handful of projectors that can be correctly labelled ‘native 4K’. This means that if you plug a 4K signal into the projector it processes it without any conversion or scaling, delivering the identical 8.8 million pixels being fed to it. This is achieved with their proprietary 4K SXRD panels, delivering four times the detail of Full HD.